Madison Square Garden will be the site when Pittsburgh and Davidson square off in the Showcase Game of the fourth annual Gotham Classic on Sunday at noon. Both teams are off to sensational starts. Pitt is 8-1 and ranked sixth nationally in offensive efficiency. The Panthers feature the junior front court tandem of Michael Young (17.4 ppg) and Jamel Artis (15.1 ppg). Davidson is 7-1 and boasts the nation’s second-leading scorer in junior Jack Gibbs (25.3 ppg). With Gibbs leading the way, Davidson is averaging 86.1 points per game, which is tied for 13th nationally. This will mark the sixth time that Pitt and Davidson will meet. The Panthers hold a 3-2 series lead with the last game having been played in January of 1974. 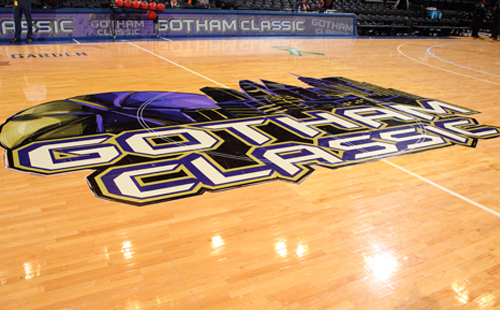 Tickets to the Showcase Game of the Gotham Classic can be purchased at http://bit.ly/1OlTywJ. Previous Gotham Classic champions include Temple (2012), Ohio State (2013), and Richmond (2014).